Transforming your outdoor space with. 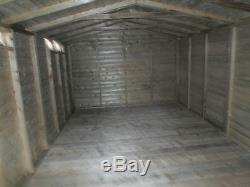 A tailor made storage facility. Managing Director David Clayton of Northern Garden Sheds LTD was awarded Young Business Person of the Year 2013 in the Journal annual Business Awards and also received the David Goldman Award for Innovation and Enterprise. Please read our specification list carefully and understand the quality and thickness of wood that we use compared too many of our competitors. ALL OUR SHEDS COME STANDARD WITH A 19mm T & G FLOOR AS OPPOSED TO THE MAJORITY OF OUR COMPETITIORS USING THE SAWN BOARD OPTION. 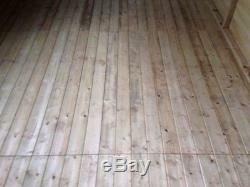 Sawn floor boards from the UK are generally damp and so over time as they dry out and will most definitely leave gaps in your floor. The T&G floor will maintain its shape throughout and is the perfect solution to not getting the floor gaps. All of our sheds and summerhouses are manufactured using a redwood tongue and groove as oppose to most our online competitors who use a white wood. 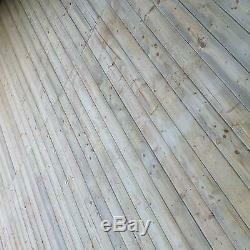 Redwood grows slower than whitewood this means it is denser and better for joinery purposes. Redwood and whitewood season well, but whitewood is more likely to distort. Northern Garden Shed Ltd is a proud family run business based in the heart of the north east at Newcastle upon Tyne. We deliver within 200 mile of Newcastle upon Tyne. Fitting is offered within 100 mile. 16x10 apex roofed shed in our tanalised 19mm T&G, giving standard protection for 15 to 20 years without you having to treat it yourself. A standard height of 5ft10 at the eaves and 7ft at the ridge. The shed has a 6ft wide and 6ft high double door, this can be kept in the same place as in the listing or it can be moved to suit your own preference. The shed comes with 6 windows as standard, additional windows can be fitted at an additional cost. All of our sheds are available in the following thicknesses of wood. 13mm, 19mm and 22mm red wood T&G with a pressure treated tanalised finish. 3x2 CLS framework throughout the shed. 13mm red wood T&G roof board cladding. 90KG heavy duty green mineral felt. 24" X 18" 3mm horticultural single glazed glass (non-opening). 18 Medium black tee hinges. TANALISED' timber has been impregnated with a preservative solution under high vacuum pressure in an industrial vessel. This treatment process ensures deep penetration into the timber cells, for a longer-lasting protective result against fungal decay and insect attack than the application of a surface coating. Pressure-treated timber is leach resistant, ensuring a long and trouble-free service life in a wide range of conditions, and assured performance in sensitive environments such as vegetable plots and areas of wildlife. Desired service lives range from 60 years for internal timbers and 30 years for external timbers such as fence posts in ground contact. The treated timber initially assumes a green colouration, which fades to a honey brown over time and eventually a silver grey. No surface applied product is needed to maintain the integrity of the treatment. Note: 3x2 CLS framework has a finished size of 63mm X 38mm due to the corners being rounded. This provides a smoother and safer finish. Note: 4x2 CLS framework has a finished size of 89mm X 38mm due to the corners being rounded. WE DO NOT USE ANY SHEETED OSB, PLY OR CHIPBOARD IN ANY OF OUR QUALITY BUILDINGS. Padlock fitted with hasp and staple, and door handles. Shed to be screwed together not nailed. Meet our following requirements, if these requirements are not met then you are at risk of not receiving our expert fitting service. Have a complete, flat, solid level base with either slabs, concrete or decking. Customers wanting to build timber frames or use sleepers must let us know when placing the order. Have clear access to your base and allow 7ft 8 of height clearance so the sections can be moved into place. (the shed will not fit under a standard doorway). When placing orders please state any access issues and we will advise on any requirements. We require some room all around the building to allow for the roof overhang and the fitting of the facia boards. We realize that some areas are tighter than others but please remember we also need room to work and get the shed fitted for you. A minimum of 8 inches. All enquiries will be answered within 24 hours. 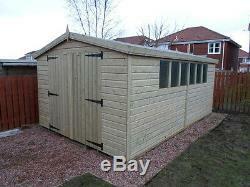 The item "GARDEN SHED TANALISED SUPER HEAVY DUTY 16X10 APEX 19MM T&G GARAGE. 3X2 6FT DOOR" is in sale since Wednesday, October 24, 2018. 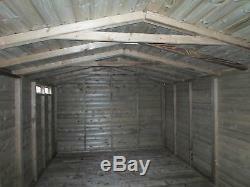 This item is in the category "Garden & Patio\Garden Structures & Shade\Garden Sheds".ltd" and is located in Newcastle Upon Tyne, Tyne and Wear. This item can be shipped to United Kingdom.